Find Barons Beer kits by using the WINE AND BEER KITS tab, or clicking here. LIMITED RELEASE * call your favourite Home Vintner location for details on availability. 15L premium wort kit to make 23L of craft style beer. DESCRIPTION: It's like a hot Rum Toddy that turned the corner and met Mr. Porter. This is a festive beer that's a party in your mouth! The combined flavours roll you a most exciting ride, the buttery rum accentuates the toasty crisp chocolaty char coffee looping through and holding you with the melding festive cinnamon rum flavours till you get pulled out the other side saying to yourself, wow di that really happen? The head retention does not dissipate, the Belgian lace is there for the evidence and it's not overpowering or filling. INGREDIENTS: Malts: Pale, Crystal 120, Munich 10L, ESB, Chocolate, Wheat, Black. Hops: Hallertau and Saaz. Other ingredients: brown cane sugar, butter rum, spices, lemon zest and vanilla bean. Bitterness 25-30 IBU, O.B. 1.055-1.060, Alcohol 5.5-6.0 alc/vol. INGREDIENTS: Malts: Pale Pilsner, Crystal 60, Wheat, Crystal 120 and Dark Chocolate. Hops: Amarillo, Cascade, Centennial and Hallertau. Other ingredients: Kentucky Honey Bourbon. DESCRIPTION: At 7.1% alc/vol with over 65 IBU’s its big, dark, golden; appropriately hoppy which leaves you with a well balanced mouth feel that’s refreshing with citrus flavours. INGREDIENTS: Malts: Pale, Munich 10L, Carapils, Crystal 60L, Vienna. Hops: Amarill, Cascade, Centennial, Simcoe. DESCRIPTION: A pale to straw golden colour lager has good carbonation and a clean, with slight sweetness and a refreshing crisp finish. Lower in alcohol so you can enjoy more than one. INGREDIENTS: Malts: Pale. Hops: Galena. Adjunct: Flaked Maize. INGREDIENTS: Malts: Pilsner, Vienna, Munich, Wheat, Dark Chocolate Malt. Hops: Perle, Saaz. Bitterness 10-15 IBU, O.G. 1.048-1.052, Alcohol 5.0-5.2 alc/vol. DESCRIPTION: A classic, the Euro Pils has the malt forward flavour and slight sweetness balanced with smooth hop profile and fresh spicy floral hop aroma. INGREDIENTS: Malts: Pilsner. Hops: Hallertau, Tettnang. DESCRIPTION: Hefeweizen is a traditional Bavarian wheat beer and with certain yeast will produce a signature clove and banana character. The hopping rate is low, which allows an underlying, grainy, bready flavour from the wheat and Pilsner malt to shine through. It is a light approachable beer with a hazy appearance and has a soft texture while quenching your thirst. INGREDIENTS: Malts: Heat, Pilsner. Hops: Tettnang. DESCRIPTION: A very pleasant easy to drink Ale, the malt characteristics give a flavourful refreshing foundation for the hint of honey and citrusy hop notes. On this note lets all help save the Bee’s, without them life on earth will be very different as we know it, Bee aware, Bee helpful, thank you for Beeing there! INGREDIENTS: Malts: Pale, Honey. Hops: Hallertau, Centennial, Clover, Honey. DESCRIPTION: The Lite is a pale golden, crisp; clean easy to drink beer with a lower alcohol level that shares pure refreshing flavours and aromas. INGREDIENTS: Malts: Pilsner. Hops: Cascade, Saaz. DESCRIPTION: This is an elegant, malty German amber lager with a clean, rich, toasty and bready malt flavour, minimal bitterness, and a dry finish that encourages another drink with friends. The overall malt impression is soft and complex, with a rich aftertaste that is not too sweet. INGREDIENTS: Malts: Pilsner, Munich 10L, Vienna, Carapils, ESB Pale Malt. Hops: Hallertau, Tettnanag, Saaz. Bitterness 20-24 IBU, O.G. 1.055-1.060, Alcohol 5.5-6.0 alc/vol. DESCRIPTION: Deep golden amber in color with a brilliant perfumed nose; dry hop fermented with tropical and citrus notes lets the medium body beer taste nicely from a lightly sweet to a dry and mild bitter finish, deliciously quenching! INGREDIENTS: Malts: Pale Ale, Crystal/Caramel 60L, Vienna, Munich 10L, Carapils. Hops: Amarillo, Cascade. DESCRIPTION: A malty dark ale with its complex and flavorful roast characteristics, this beer is designed to tease your taste with caramel flavors, and hints of toasted grain bread. Hailing from England, the Porter is a smooth drinking brew with notes of chocolate, caramel, roasted flavourings and a wonderful smooth ride on your palate that will make you go Ahhhh! Another one please! INGREDIENTS: Malts: Pale, Crystal, 120L, Munich 10L, Chocolate, Black, ESB. Hops: Northern Brewer, Hallertau and Saaz. DESCRIPTION: A beautiful malt-driven beer with medium hop character, caramelly with a touch of coffee like bitterness on the finish from the chocolate and roasted barley, with a deep reddish hue imparted by the selected malt used. INGREDIENTS: Malts: Pale Malt, Pilsner Malt, Crystal 60L, Crystal 120L, Dark Chocolate Malt. Hops: Amarillo, Centennial, Cascade. DESCRIPTION: This beer makes your mouth water, it’s fresh and pure, and it is a fine balanced Bohemian style Lager which is a little richer in color leaning to deep burnish gold. The use of the Pilsner malt along with Vienna and Wheat gives it a light clean quenching taste, yet balanced with the Perle and Saaz hop characters that are complex and lend a pronounced spicy, fruity, floral bouquet that all ends at the same time in the finish. INGREDIENTS: Malts: Pilsner, Pale, Vienna. Hops: Cascade, Saaz. You need to be on the Half Hitch mailing list to receive notification of releases, and have the opportunity to order these wort kits. 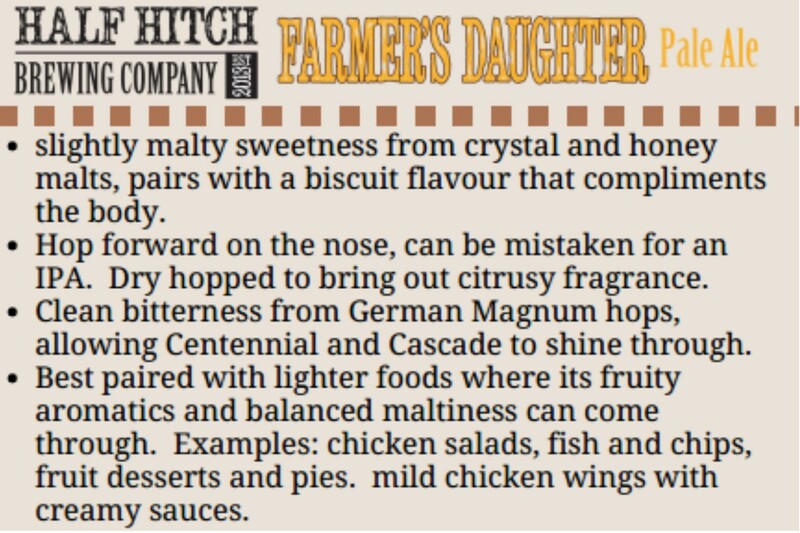 Farmers Daughter Pale Ale : Slight malt sweetness, hop forward with a citrusy aroma. 4.5% / 30 IBU. We will be bringing these kits in FRESH - straight from the brewer as they are being crafted. These kits are a full 23L of wort, ready for you to brew at home. Availability of this kit will be based on production runs at the brewery. Please get on our Half Hitch email list to be advised of when kits are being released and give you the opportunity to order. We will always try and pull in a few extra kits for our stores, but are working to maximize on the freshness of this craft opportunity. Just add the yeast and brew - it's that easy. CIDER HOUSE SELECT. APPLE CIDEER. A traditional hard sparkling cider that is packed full of flavour. Crisp, light and refreshing! A perfect choice. CIDER HOUSE SELECT. SPICED APPLE CIDER. Apple cider with cinnamon and spice. Serve chilled or as a warm mulled cider. Hop varieties in pellet form. Amarillo is an aroma variety of hops, giving off a medium strength aroma that is very distinct. Expect floral, citrus and tropical tones, possibly some orange. This hop is used for both flavour and aroma. It also may be used for bittering. Typical beer styles: American and Belgian style Ales, IPA's, Double IPA's. This hop is also making it's way as a single hop IPA variety, as well as showing up in Rye IPA's. Chinook hops are used primarily for bittering - steeped, but also has good aromatics. Characteristics can include a moderate to strong, spicy aroma with notes of pine and grapefruit. Typical beer styles: Barley Wine, India Pale Ale, Lager, Pale Ale, Porter, Stout, Winter Ale. The Citra Hop has been a very hard to come by hop variety for home brewers in Canada. High in Alpha acids with a very noticeable strong yet smooth floral and citrus aroma and flavour. There is no hop that is used as a substitute for this unique stand alone variety, which becomes more popular by the day. Pairs well with Pale Ale's or IPA's - also exceptional as a substitution for the hops in the Home Vintner add on recipe package to produce our Rye IPA. Aroma: Citrus, peach, tropical fruits. Flavour: Similar to aroma with a bittering component that is not noticeable in the aroma. Desired as both an aromatic hop as well as a bittering hop. Staff pick for favorite commercial application: Rye Sally Rye - a Rye IPA from Tamarack Brewing Company in Montana! This hop is used in our Craft Beer Add-On Packs to produce: Lemon Citra Cerveza and Citra Pale Ale. Saaz is a "noble" variety of hops. This hop is used extensively in Bohemia to enhance beer styles such as the Czech Pilsner or Bohemian Lager. Saaz has a very distinctive flavour. When used in beer, the resultant aroma is very mild, earthy, herbal and spicy. Despite it's popularity, Saaz generally has a very low Alpha Acid level which makes it not very effective as a bittering hop. This noble hop is used for aromatics. Typical Beer Styles: Pilsner, Lager, Lambic, Belgian-style Ales. Goldings is a group of aroma-type cultivars originating in England and is now also grown In the USA. Called the premier English aroma hop, it is superb in English-style ales, and lends a unique character to fine lagers as well. This hop has a unique spicy aroma and refined flavor. Hallertau mf (Mittelfrueh) is an aroma-type cultivar which originated in Germany. This is a middle to early ripening cultivar. This hop is an excellent choice if you are looking to brew an authentic European-style lager. Mild spicy flavor and aroma. Simcoe is a bittering hop with good aromatics - so a dual purpose hop. Characteristics can include citrus, passion fruit, earth, and uniquely intense pine. Fill with hops, grains or fruit and tie to close. Larger sized mesh bag used to constrain additions to your fermentation pail. This is where you will find dry ingredients to customize your beer, such as Oak and Dry pitch yeast. Corn Sugar - or Dextrose. For Priming or for brewing fermentable additions. Used at bottling stage of beer to carbonate. Any carbonated beverages must be bottled in appropriate bottles for pressure. Amount appropriate for carbonation of 23L of beer. Wyeast Laboratories revolutionized the home winemaking industry in 1986 when it introduced Vintner's Choice 100% Pure Liquid Yeast and Malo-lactic Cultures. Now professionals and hobbyists worldwide count on the reliability, freshness, purity and extensive strain selection provided by Wyeast to produce fermented beverages of unequaled quality and diversity. Special orders are welcome; let us know which Yeast you need. We have pulled in a limited special run of this yeast strain. Beer Styles: Saison, Brett Beer, Mixed-Fermentation, Sour Beer, Wild Specialty Beer, Belgian Golden Strong Ale. Profile: A blend of Saison yeast and Brettanomyces creates a dry and complex ale. Classic earthy and spicy farmhouse character meets tropical and stone fruit esters. Aging brings elevated brett flavor. Expect high attenuation with this blend. NOTE: We suggest to PLEASE PHONE or EMAIL our NW or Airdrie locations to reserve this yeast for yourself in advance of visiting location! Limited quantity available.